Earlier this year, (actually MUCH earlier this year --- I am months behind!) some of my favorite bloggers celebrated "May for Me." It was a month filled with quick projects, posts filled with happy notes of time spent playing with fabrics, or just playing in general, and doing things that brought joy to the do-er. In other words, we gave ourselves permission to just have fun! We put this aside . . .
We enlisted our kiddos to help out . . .
And we made sure we spent time having fun . . .
. . . with our families and with our fabrics! One lady that is close to my heart offered a Quilt Along, with pieced blocks and stitcheries. 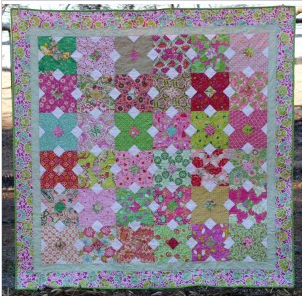 Tonya, of Hillbilly Handiworks, did an awesome job of designing a lap quilt to go with the springtime theme. Here are some examples --- Tonya completed one, and Sharon did too! Now, here is the better-late-than-never part . . . I'm only just now completing some of the sections! I'm utilizing the May for Me piecework, and a couple of the stitcheries (Thanks, Tonya!) for a quilt for my mom-in-law! Oops! The photographer got a little wonky there! 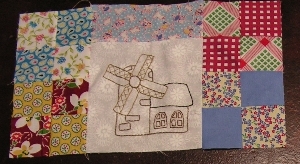 I'm using some of my beloved thirties repro prints and solids, and this is the windmill stitchery block. 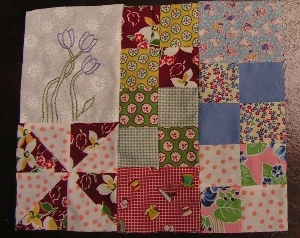 Here is the block with the tulip stitchery . . . I'm adapting and adding to the design that Tonya graciously gave to us. Tailoring it, you might say, to my mom-in-law's personality. Well, actually to her history. I'm adding some things that reflect the stories she has told us, of her childhood. See that wee little rocking chair? When she was just a little bitty girl, she and her sister received small, red rocking chairs and baby dolls to lavish TLC on . . .
She has told us that many evenings they would sit in their rockers in front of the fire, and tend their "babies." They would rock, and rock, and then their eyes would meet, and one or the other would start to giggle. Well, you know what happened then --- a giggle fest! They would chuckle and snicker and try so hard to be quiet, but then they would look over at one another again, and whoops! There they went again! I'll be showing you some more of the blocks as I complete them, and tell you the stories behind each one. I hope that you like seeing my work-in-progress! It's Muse - Day Again! 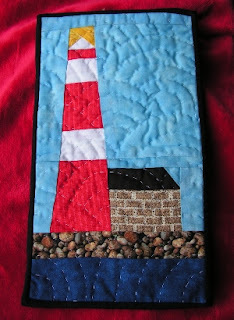 Here at Lilypadquilting, Tuesdays are Muse - Days! Last week, Elby introduced the idea: the Muses were those lovely Greek ladies that were in charge of inspiring humans to lofty heights of poetry, song, and art! This week, I have found a lovely lady that will definitely inspire you!! 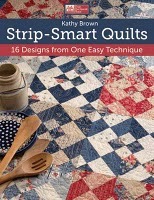 Many of us are struggling to learn how to "free motion quilt." We have heard it said that it takes "practice, practice, practice!" And we practice some more. Sometimes it helps to look at an example of a project that someone has completed. And they've done a great job on it. And it looks be-yew-ti-full! So, click on the link right here: THIS IS THE LINK and you will be transported via a magic carpet whisked away to see a lovely quilt that was entirely free motion quilted with loving care --- by the Green Fairy herself, Judi of Green Fairy Quilts. Have a happy Muse - Day! 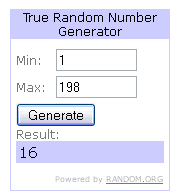 We Have a *FLURRY* of Winners! Oh, I know it's been a long week for you. You've been gazing sooooo longingly at that DELECTABLE Flurry, by Kate Spain. Wondering if you could build a time machine to scoot ahead to this very day, and win it!
. . . Ya know, it truly is a lovely line of fabric . . . I think it wants me to keep it . . . Hmmmm, I wonder if anyone will notice if I kidnap some of it? [Padsworth steps in] Oh! Hi, Padsworth! Me? Oh, no --- I wasn't going to take it --- honest!!!
. . . He doesn't believe me. But *LOOK* at this fabric! Can you blame me?!? Of course, The Fat Quarter Shop, one of our fabulous sponsors, has lots of options for me, and for those of you who didn't win prizes, today! With great pricing and lightning-fast shipping, they're an awesome resource for all of us --- so, we can all have some! Thanks go out to everyone in our Lilypad Quilting community for a great turnout for our giveaway, and especially to our lovely fellow bloggers who spread the word about our prizes! And a heartfelt thanks goes to Jeanne, over at Heat Press Batting Together --- without her product, we'd still be zigzagging batting together for large quilts and for small projects, too! Don't forget now, if you are not one of our winners, hop over to Jeanne's site and order a roll to save your sanity, OK? That one roll will go on for 999,999 miles. See? Lookit!
. . . Okay. Maybe I do get carried away. Sometimes. 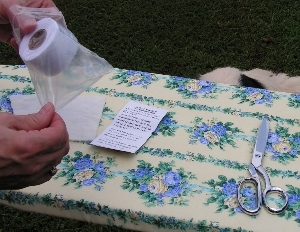 That one roll will help you with three full size quilts, or many, many small projects! And to clinch the deal, she offers free shipping all the time . . . not just every now and again. So, you can drop by any time and purchase some Heat Press Batting Together --- you'll love it! Now, let the FLURRY of winning begin!! 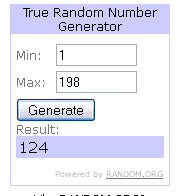 First winner: We asked Monsieur Random dot Org to help, and he chose comment number . . . one hundred and twenty four! Comment #124 was left by Quilt Pecan/Angela, who said . . .
Way to go, Angela! Your purchase allowed you three extra comments, and Monsieur dot Org picked one of those! I'll be contacting you for your shipping information momentarily! Second winner: Next, Monsieur dot --- oh, I'll just call him "Randy". Well, Randy took a deep breath, closed his eyes and jabbed his pudgy little finger at . . . sixteen! Comment #16 was left by Jessica, who said . . .
Awww, congratulations, Jessica! :) And I'll be touching base with you, too, and get your prizes sent out, tout de suite! Well, all that excitement was exhausting!! I guess that wraps it up, for today --- congratulations to our winners, and --- huh? Wait, you mean --- no way!!! Padsworth says we have one more winner! 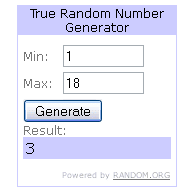 I don't believe it --- THREE in one giveaway! I'm gonna need more coffee . . . [slurp] That's better. Okay! Let's do the finale!!! Wow. He's got skills. He even added a guitar in there, too . . .
Well, we were honored that eighteen special blogging friends posted our giveaway on their blogs! One of these bloggers will win our EXCLUSIVE "blogger's prize package", right now!! Third winner: Will somebody help me wake up Randy? I think he's all tuckered out. Ah, there we go! Once more, monsieur!!! And thus Randy picks number . . . THREE! The third blogger in our list is Anita, who said . . . Yay!! Padsworth and I are clapping our hands (well, in his case it's little feets!) for you, Anita! You've got a really special prize!! 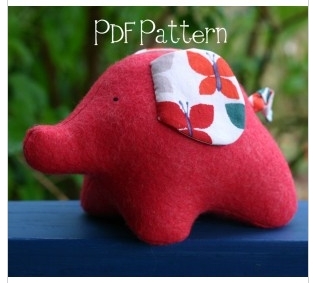 I will send an email winging its way across cyberspace to you, for your shipping information! Well, I think this time, we *are* done. Right, Padsworth? Phew! He's says we're done. What a hard-working little fella he is, too. Such an excellent work-ethic is no doubt coupled with immense kindness and generosity. No, I'm not trying for a raise . . . but I would like a little Christmas bonus, this year --- how 'bout it, boss? Aw, you're as stingy as ever, you amphibian! Hey! Get back here! Oh! Um, thanks again to everyone who entered our giveaway! Stay tuned, because we have some fun posts scheduled for the coming days! Congratulations to Two of our Followers! Pet Parade Winners! There might be someone else among the winners, who is a follower here at Lilypad, but I know for sure that two of our peeps won prizes in the Pets On Quilts 2011 Show!! Let's give them a hand!! I'm just tickled pink for the both of them!! 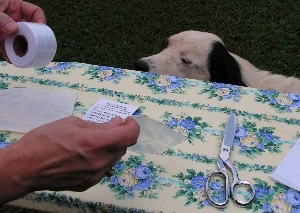 And I can't wait till next year --- Pets on Quilts was a blast! SewCalGal does an awesome job of organizing it! Serving Up a Special Review *AND* a Giveaway! Now Closed!! You can't rush good cookin', so I've heard . . .
chant it with me . . . Flur-ree, flur-ree, flur-ree! 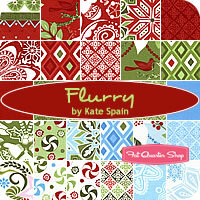 Yep, at the end of our review you will have a chance to win our great mystery product, and some Flurry by Kate Spain. I know, right?! Get back here and listen! 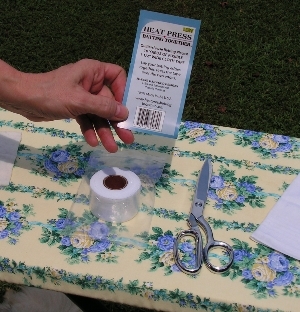 No fair scrolling to the bottom to see the prizes --- and you'll be happy that you read this, cos this is a neat problem solver for us quilters! Have you ever been working on a project and had some batting that you had to trim off? Seriously, who hasn't had that happen?! 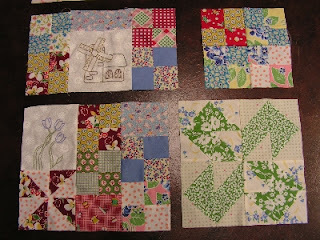 I wanted to make a mug rug, so I pulled out these smaller scraps. But this is a great place to show you the new product I discovered! Once upon a time, there was a long arm quilter named Jeanne who didn't like seeing all the batting that was trimmed away as she quilted her customers' projects. Jeanne had a large stack of batting from her projects, and when she worked with charitable groups, such as Quilts for Veterans, she saw it happen there, too. Some of the pieces were large, but they were odd sizes which were difficult to work with. Well, I know I have had that happen --- and I bet you have, too. You have to try to put the batting together somehow . . . it doesn't like to stay together if you just lay the pieces side by side. 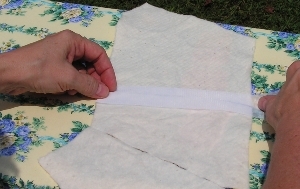 You can use brute force and zigzag stitches to put the pieces together, but that usually leaves little bumps here and there, and is not too easy to needle through, if you hand quilt like me. "Heat Press Batting Together" to the rescue!!! If I had a trumpet, I'd blow it, because this is great stuff! OK, first you slide the roll out of the package . . . There is a piece of plastic around the roll, to keep it nice and tight until you use it. 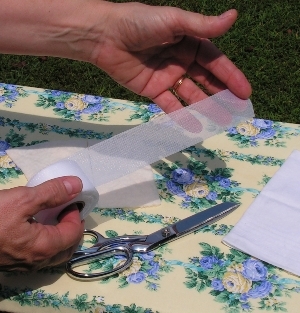 Cut the wrapper very carefully. "Whatcha doin' this outside for, huh? Slurp!" Heat Press Batting Together is very light and thin. It is soft and stretchy --- but don't be deceived! You'll see later in this tutorial that it is really strong. Cut a length that will go across your pieces of batting, and lay the Heat Press rough side down on there . . .
Make sure your iron is set to the correct setting for your particular type of batting. 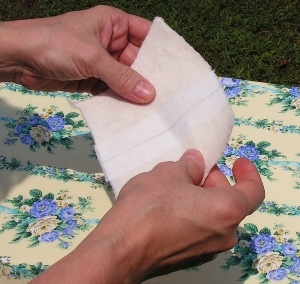 The lady who created this product tested it and had other quilters (100 of 'em) test it, too. 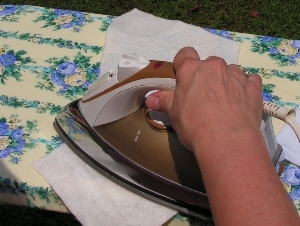 Does your iron have a teflon-coated plate? Then you should try the low cotton setting. Does your iron have a uncoated metal plate? --- and a quick, up and down motion. Are you using a mixed batting? Start with the "wool" setting. I was using a cotton batting, so I tuned my iron to the low end of "wool". By the way, has anybody noticed that gorgeous ironing board cover? Once the Heat Press is ironed on, you will be surprised at how strongly it holds --- and it's stretchy!! Just look! Let me tell you, I REALLY pulled on this bond. It stretched, but held beautifully, and went right back into place when I let go. I gathered up all of my pieces, and sandwiched the mugrug together. Then, I tested it to see how it quilted . . .
Now --- to be completely honest . . . . . It's perfect! (Ha! All you pessimists in the audience thought it would be bad news, didn't you?) But I have to tell you --- I was pleasantly surprised. When I needled across the area where the Heat Press was, I couldn't tell it was there! No, honestly! Completing my mugrug was easy peasy --- here it is! As a small business owner myself, I always want to help out other small businesses, and I want to spread the word! Ya'll really need to try out this product. It works *better* than one I tried that was made by a much larger company, it's reasonably priced, and available online with FREE shipping! 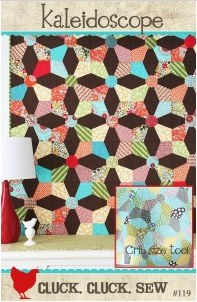 Do yourself a quilty favor, and check out their site! They have a video there, too, to help you get started. Have ya seen the Flurry pre-cuts at the Fat Quarter Shop? Oh, I know you have . . . your screen probably has little nose prints on it from all your day-dreaming! 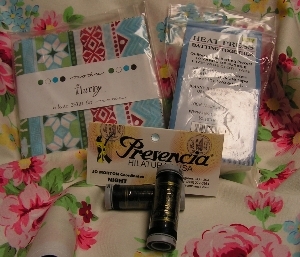 We will have two lucky winners of a Flurry charm pack, a roll of Heat Press Batting Together, and some Presencia threads!! Feast your eyes on this! Now, I have a *special* prize for one lucky blogger who posts our giveaway on their blog . . . I want to do something a little different this time! For your first entry, leave us a comment about Heat Press Batting Together --- and of course, we hope you are a follower! Here's the fun . . . for your third chance, leave me a comment and tell me what song you think of as your "life song". It can describe you, your life, your dreams, whatever! Lastly, if you blog and you post about this giveaway, you will be eligible for the *special* bloggers' prize up there! 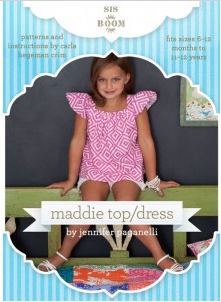 A warm thank you to Jeanne at Heat Press Batting Together for sponsoring this giveaway! (hee, hee! I love puns!) We'll leave this one open till the 25th, and announce our THREE winners on the 26th! P.S. If you order a roll from Jeanne, you can come back and leave me three comments that you did . . . haha! Three extra chances to win!! What this means for you is that now we can address customer issues and requests with lightning speed! Zooming across cyberspace to answer the call! Stopping at nothing to ensure that our customers are happy!!! Huh? Wha? Oh --- I'm back! ;) Boy, that bread is good! On the technical side of things, I should let you know that certain browser and antivirus combinations don't play well with secure web sites. In my experience, using Vipre antivirus (my favorite) and Internet Explorer together makes them tend to throw hissy fits when trying to communicate with a secure site. 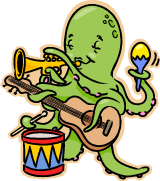 If you encounter any problems with the new site format, please, let me know! In general, just using a more advanced browser fixes everything. Firefox, Chrome, and Safari just love it! 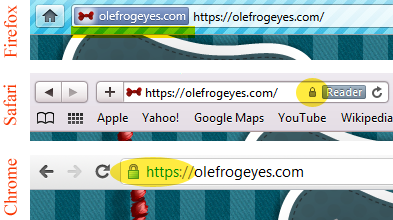 It even makes them add some fancy icons and colors to the address bar --- see? Thanks for reading the tech update, and please, let me know how I can help! Edited to add note from Snoodles: There is a giveaway going on at Green Fairy Quilts.....Judi and Clint are raising money for their mission trip to Romania. 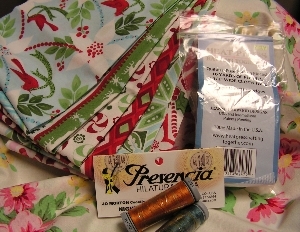 If you would like to donate, or even if you don't, there is a nice giveaway of fabric! They raise all their own funds for the trip - let's help 'em out, OK?! Thanks! They have batting and backing and books and rotary cutters and seam rippers and seven different manufacturers' rulers and .... and.... I just gotta breathe! OK - I just got overwhelmed with all of the goodies that are waiting to go to new happy homes from the shelves at Dewberry Lane!! Maybe I should just show you a few of the treasures there - but keep in mind, if I were to show them ALL to you....we would need more than just a cuppa joe on our desk; we'd need some serious sustenance to tide us over! They have twelve different sizes of rulers, and tape to highlight 'em, and a rack to put 'em in!! Here. Take a peek! 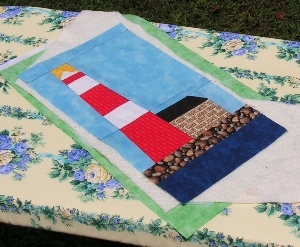 Anybody here working on a Dear Jane quilt? These will keep you happy-dancing! Is one of these on your wish list? (It's on mine, for sure!) Tell your sweetie that it's in stock at Dewberry Lane! This handy-dandy one from Omnigrid will help you square up blocks up to 9.5 inches! That's a workhorse of a ruler, let me tell you! 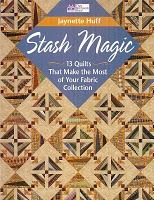 And this rack will keep them all within reach, but organized, so you can grab just the one you need for that late-night quilting session, when you tell yourself just-one-more-block-and-then-I'll-go-to-bed. Ever been there? I thought so! Sigh. I guess instead of telling you about all the gorgeous colors of thread, the cute and sassy license plate holders, and all the rest, I should just turn you loose to go check out the store! So, head on over to Dewberry Lane, and shop your little hearts out!! But don't worry about your wallet....they have great prices there, too! You'll be happy with all of the excellent quality notions there, but you'll be even happier when you see you haven't emptied your wallet! And one more thing - if you notice their cool button on our sidebar, you'll see that they have a drawing every month for a free pattern!! How do you enter? Well, I was getting ready to tell you that! Just sign up for their newsletter when you are visiting, and you will automatically be entered in the drawing! Don't forget to tell them that Snoodles sent you!! Subscriber Spotlight - - Yvette!